Teeth are held in the jaws by their roots. Front teeth normally have one root, but teeth further back have more. To keep root canals dry during treatment the dentist may stretch a sheet of thin rubber around the tooth, on a frame outside the mouth; this is called 'rubber dam'. Having this fitted makes the treatment more comfortable. 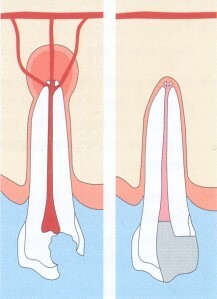 You will be given a local anaesthetic, and then an opening is made through the top of the tooth, down into the pulp. At this point, the dentist may put in a temporary filling and possibly also give you antibiotics if any infection has spread beyond the tooth. lf so, you will have to return at a later date, once symptoms have settled, so the dentist can complete the treatment. Root-fillings are usually successful and can last many years, but re-treatment is also possible if infection recurs. Occasionally, if inflammation persists at the tip of the root, surgery can be carried out to remove part of the root, clean the area and put in a filling. This is known as an 'apicectomy'.